She is a mathematician and adjunct professor at Cornell University. 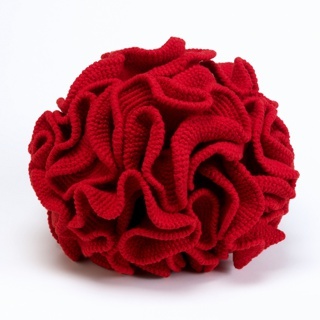 However, she is best known for crocheting objects to illustrate hyperbolic space. In 1991, she received her doctorate from the University of Latvia in mathematics. After seeing a flimsy paper model of hyperbolic planes in a workshop in 1997, she made a durable option by crocheting a model. These crocheted models were presented in textbooks that she and her husband co-wrote. Taimina’s models allowed for a more approachable method to understanding hyperbolic space and geometry. She gave workshops to children and adults. Additionally, she was invited to exhibit her crocheted objects in galleries and museums. We have one object that Daina Taimina has been involved with.